If you have ever been reading a web page or website in Safari for iOS and wanted to quickly locate a particular text phrase or word within that active webpage, you’ll be happy to know that searching for matched text in Safari has gotten much easier on the iPhone, iPad, and iPod touch with the latest releases of iOS. With modern iOS releases, you’ll find a simple to use and easy to access “Find on Page” option in Safari, which quickly matches any searched text on a webpage in the Safari browser. 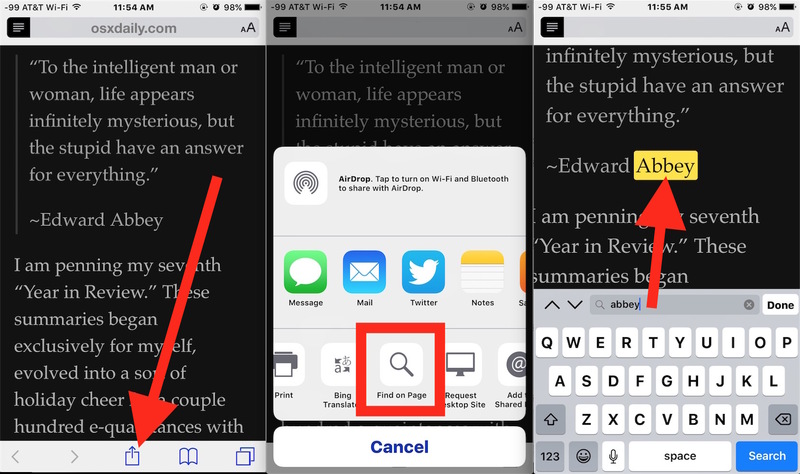 This is a very useful feature that is now quite simple to access, let’s review how finding on page works in the latest versions of Safari for iOS. You can clear the search phrase and search again, or just tap the “Done” button and be done with it if you found what you were looking for. In the example shown, a webpage was searched for “Abbey” and the resulted was found, matched, and highlighted on screen. This applies to Safari in iOS 9 and newer, older releases have different methods which are linked to below. This approach is much easier to find matching text on pages compared to what existed in prior versions of iOS on the iPhone, iPad, and iPod touch. While matching text phrases is possible in prior versions, searching for text on web pages in Safari for iOS 8 and iOS 7 and finding matches in Safari for iOS 6 and iOS 5 was much more difficult and a bit more confusing to access, which led many users to believe the feature didn’t exist at all. While Apple has changed this option several times, hopefully the newest version which is quite easy to use and access for finding text match on any web site will stick around. This is much better than it was in prior versions, which felt like a game of hide and seek. 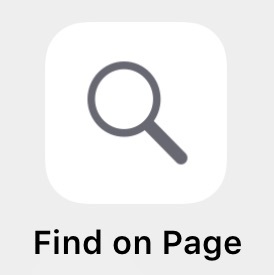 I use Find On Page often for research, so it’s great to have it as a real option in the sharing action menu of Safari. Good that it’s more obvious, but the old method still works fine (been using it for some time). On < iOS 8, tapping in the Search space (even though it says Google or whatever your prefs have) brings up the Find on Page facility as well as the Google search bar. On the Mac, its command+F, simple. I am trying to do this, but it won’t highlight it or take me to it on the page. It says there is a search result (or multiple) but it doesn’t scroll to them, tapping the Up and down arrows to move between search results also does nothing. I can’t seem to find anything about it on google. Anyone have help? Many thanks for the info… it’s also *super* handy that if you choose the “…” button at the end of the second row under the “Share” menu you can change the order of the options presented, allowing you to make “Find on page” the first choice (or second or last… where ever you want *any* of the buttons to be) when the Share menu is opened ! !